Sri Krishna Deva Rayalu and his court Bhuvana Vijayam comprising Ashta Diggajas was taken as a model by many kings and kingdoms in and out of the Indian sub-continent. Rayalu was known for his fondness towards literature and his patronage towards poets and composers. Rayalu was compared to one of the greatest ever kings of the country King Bhoja, for his inclination towards developing literature and composition. Rayalu himself was a scholar in Sanskrit, Telugu (Andhra) and Kannada. 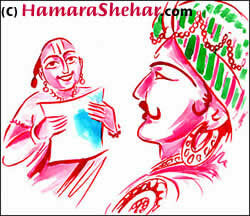 Most famous among the Telugu compositions of Rayalu were Amuktha Malyada, and Vishnu Chitheeyamu. Both the compositions were based on God Vishnus devotees. Life sketch of devotee Vishnu Chitha, Goda Devi’s devotion and God’s testing were the key elements. Goda Devi was a devotee of Lord Krishna right from her childhood. She adored Him ad finally she marries Lord Krishna. The heartfelt expressions of Goda Devi about the Lord Krishna and her lifestyle were decoratively in Amuktha Malyada. Though Amuktha Malyada was written in Telugu, it was majority filled with usages of Sanskrit language and was not generally understandable by the common people. However, the scholars and persons with proficiency in Sanskrit applauded the book. They appreciated the expression of feelings, narration style and presentations of grammar and usages. A criticism was in circulation about Amuktha Malyada during those days. It was said that Allasani Peddana authored it and named to be written by Rayalu. Critics also cited a line from sonnets written in both Amuktha Malyada and Manu Charithram starting with “Neela Meghamu Daalu Deelu Cheyu Gajalu…”. Allasani Peddana wrote Manu Charitram, sometime later to Rayalu writing Amuktha Malyada. There was also a discussion that Allasani Peddana with high regards to King Rayalu took the sonnet and presented it as it was written in Amuktha Malyada. Anyway, the criticism and discussion for and against Amuktha Malyada went on for quite sometime. One day, Rayalu during the literature discussion in Bhuvana Vijayam asked the present poets and experts to comment over Amuktha Malyada. No one knew what the King actually wished to hear from the gathering. Almost all the renowned poets and scholars did not dare comment either for or against the book of Rayalu, thinking not to lose the place and position in the Bhuvana Vijayam. Rayalu asked Ramalinga to first explain the lacunae in the book. Ramalinga commented there were one or two usages that were irrelevant to the context of the situation. Rayalu was irritated on listening this. “Ramakrishna! Don’t you note the circumstances to wit on? I’am not convinced with your sarcastic comment. Refer to the text and pass the comment carefully quoting it,” roared the King. “Referring to the last two lines of the above stanza I recited, I feel that it was like asking a guest to have lunch from a plate that is not served with any eatables. The situation is different here and this explains something different, which is irrelevant” said Ramalinga. All the members of the Bhuvana Vijayam looked at Ramalinga appreciating. Still, they were worried what would be the reaction of King Rayalu on this straight criticism on his book.